Home » Japanese import car blog » Do imported Japanese cars have isofix? I was asked recently whether imported Japanese cars have isofix? This post is the answer to that question. Isofix is an international standard attachment system for car seats for babies, infants and children. It saves some of the guesswork and potential unsafe attachment associated with child car seats attached using the standard seat belts. Do imported Japanese cars have isofix? As is it an international standard, I’m pleased to tell you that the vast majority of imported Japanese cars do have isofix. Where are the isofix points on imported Japanese cars? Sometimes you might see small fabric labels sewn into the seats with ‘latch’ or ‘isofix’ embroidered onto them, indicating the seats that have the anchoring points. ‘Latch’ is the American equivalent of ‘isofix’ in Europe. Latch stands for ‘lower anchors and tethers for children’ and features in my table of car acronyms. Imported Japanese cars are less likely to have isofix points on the front passenger seat than European cars. In general, imported Japanese cars will have 2 isofix points on the outer 2 seats in the back. On cars with 3 rows of seats, the isofix points will usually be on the middle row of seats, again on the outermost seats. Does everything on my shortlist of imported Japanese cars have isofix? If you’d like to know for certain whether your preferred cars have isofix mounts, feel free to ask a question in the comments below and I’ll do my best to find out for you. Just wondering if you can help us find out if our 2001 highway start Nissan elgrand has ISOFIX points or what the anchor point system is. We have four children in Car seats and currently know of the three “bolt” anchor points on the floor in the boot floor. However this doesn’t work very well because of the split in the (middle of the) back seat, the (middle) strap slips down between the seats. It just doesn’t seem right. Thanks for your question. I don’t have firsthand experience of the E50 but from what I’ve read, they do not have ISOFIX points. You could check by feeling for them with your hand, between the seat back and base. If the car has them, they will most likely be on the outer 2 seats on the middle row. I’ll take a picture of the ISOFIX points on the Alphard I’ve got for sale at the moment and send it to the email address you supplied. As for the bolt anchor points, hopefully this post on the Elgrand Australia forum will be of some help. Do you know whether any Honda Stepwagons come with or can be retro-fitted with ISO-Fix points? Struggling to find a definitive answer anywhere. The more recent RG series Stepwagons from 2005 onwards do have ISOFIX points. The earlier RF series vehicles don’t have them. I haven’t encountered retro-fitting ISOFIX to the RF series Stepwagon before, so don’t know for certain whether this can be done. I hava a 2009 mitsubishi colt japenese import limited edition, does this have isofix? If ao where can i find them? Thanks so much for your website its really helpful! Hi my daughter (living in Qatar) has a 2012 imported Juke and this has No isofix mountings fitted, do you know if these mountings are available to be fitted as an extra via nissan? As she has purchased a top of the range seat and is unable to use it for her newborn baby. Was it imported from the UK? If so I was under the impression that all Jukes had ISOFIX points as standard. I have a 55 plate e51 with no isofix. Can’t seem to get any help from Nissan U.K. 0r any Japanese parts people etc. Do u know of anywhere I can get a bracket please. Unfortunately I don’t know of anywhere you could buy an isofix bracket for your Elgrand. How about contacting a breaker and seeing if they’ve got a middle row of seats for sale in the same cloth / hide as yours but with isofix points…..or even just one seat if that is all you need? There are quite a few E51 Elgrands being broken up for parts on eBay at the moment. I don’t think so. Alphards (the Mk1 at least, which is what most people seem to import/buy) have 2 isofix points. I think the Hyundai Starex (i800 in the UK) also has 2. So it sounds like you may need to keep looking if you’re after a car with 4 isofix points – sorry! I am desperately hoping that there may be some Mazda bongos out there with isofix??? I think you’ll struggle to find a Mazda Bongo (as sold in Japan) with isofix mounts. I know some of the rock and roll seats / beds fitted in the UK as part of a camper conversion can have isofix mounts included in the seat. Hello. I have Nissan Tiida 2012 1.5 hatchback imported from Japan. Although I searched too much, I couldn’t find any ISOFIX points in the car. I am wondering if Nissan have installed it on all Tiida models or some of one. Also if all models have it, I really appreciate you for helping me to find it. As far as I can tell, ISOFIX points were installed on some Tiida models but not all of them. So yours might have them and it might not. 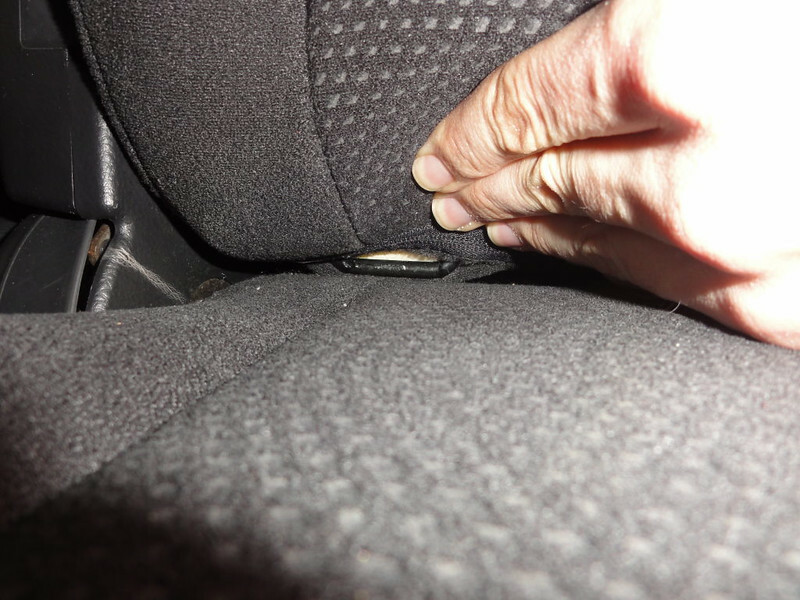 If you feel around in the gap between the back and base of the rear seats you’ll find them if they are fitted. Alternatively there may be cutouts in the lower part of the seat back to allow access to the mounting points. I don’t know for certain whether it can, but I suspect the answer is no. I’ve not seen a separate bolt on kit that could be used. It would probably be simpler to buy an Elgrand with isofix already fitted, if that is an option for you. Difficult to say for certain. Based on the information I have, I think it is more likely not to have the isofix in the back. I’d ask the seller to check for you before making a firm decision to purchase (or not) based on isofix. The ISOFIX mounts are 2 horizontal metal bars, circular in cross section. If they are present there will be one at either side of each back seat. I can’t picture the exact design of the 3rd gen Cube seats as I’m writing this, but there will either be a slot in the seat back fabric, towards the bottom of the upright part of the seat, or they will be in the split between the upright and the base of the seat. Have a look / feel around there and you should find them if they are present. There is a picture of an isofix mount higher up in the comments on this post if that helps you to know what you’re looking for. What type of ISOFIX will be in my Toyota Alphad (to know if car seat I am buying is compatible) and is it still safe to turn the middle row to reat facing when using car seats with ISOFIX? Assuming your Alphard has ISOFIX, it will be the 2 metal loops in the gap between the back and base of the seats (both outer seats on middle row). I don’t think there is any provision for the top tether. It is not safe to have the middle row of seats rear facing when using ISOFIX. Hi there can you tell me if the Nissan Elgrand have isofix points please. Thank you. I’d love to give you a definite answer to this, but in truth some do and some don’t. The only way to know for sure is to check before you buy – you can’t really use the different trim levels or versions to know for certain. I’m pretty sure ISOFIX didn’t exist at all in cars in 1996, so a 1996 Bongo won’t have it unless it has been retrofitted (very unlikely). ← How long to import a car from Japan? Question: best engine oil for Japanese cars? Sign up to receive the monthly newsletter from Andrew's Japanese Cars.